The UCLA Library has acquired the largest private collection of Ethiopic manuscripts and scrolls in the U.S., given by Gerald and Barbara Weiner. 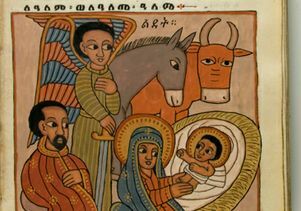 Together with the library's existing collections, this gift makes the UCLA Library the leading repository for Ethiopic manuscripts in North America. 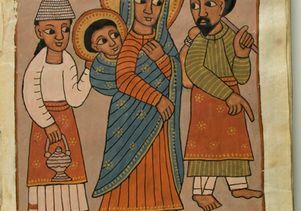 A classical Semitic language, Ethiopic is used as the liturgical language of the Christian church in Ethiopia. Dating from the 18th to the 21st centuries, the collection of 137 bound manuscripts and 102 scrolls is particularly rich in elaborately illustrated liturgical texts. Highlights include a late 19th/early 20th-century version of the Gospels containing 78 miniatures; a 19th-century "lives of the saints" with 40 miniatures; a 20th-century compilation of a table blessing and miracles performed by Jesus with 37 miniatures; and a 20th-century collection of prayers with an image of John the Evangelist and 26 miniatures. "Words cannot express our deep thanks to Jerry and Barbara — first, for building this gorgeous collection, then for giving it to us," said UCLA University Librarian Gary E. Strong. "These extraordinary items, noteworthy both for their research value and their beauty, will be of great interest to students and scholars, as well as to the extensive Ethiopian community in Southern California." The production of Ethiopic manuscripts continues to the present day, with many texts only very recently being published in print format. Scribes in religious communities work for as long as a year to produce a single manuscript, working individually or in groups and using handmade ink, pens and animal-skin parchment. 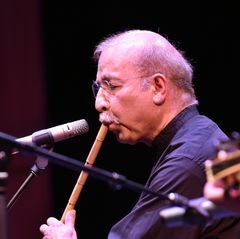 Text in the calligraphic Ge'ez script is often accompanied by elaborate geometric ornaments and illuminated frontispieces, miniatures, and full-page illustrations. 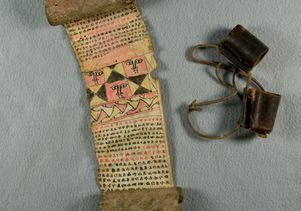 The scrolls are known as "magic scrolls" because, according to the religious tradition of the Ethiopian Orthodox Church, the prayers they contain are believed to have curative qualities. "This new gift is an important collection of manuscripts that makes UCLA's Ethiopic collection one of the best in the world for research," said William Schniedewind, chair of the UCLA Department of Near Eastern Languages and Cultures. 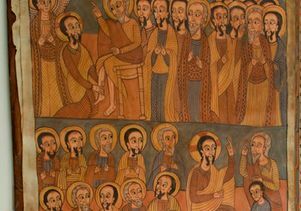 "It has the potential to serve as an excellent resource for study by graduate students and scholars and to open new vistas in our understanding of the Ethiopic manuscript traditions." Housed in the Charles E. Young Research Library Department of Special Collections, the materials will also provide a catalyst for lectures, conferences, public programs and community initiatives. 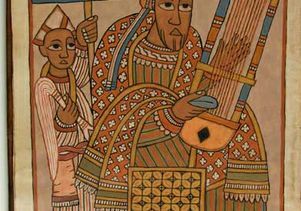 The collection complements the UCLA Library's existing holdings of Ethiopic manuscripts, which were purchased by renowned UCLA scholar Wolf Leslau on the library's behalf, primarily in the mid-1960s, during his many research expeditions to Ethiopia. Dating from the 16th to the 20th centuries, these bound volumes and scrolls encompass service books of the Ethiopian Orthodox Church, a few rare Jewish manuscripts written in Ge'ez and Agaw, and a beautifully illuminated Bible given to UCLA by Ethiopian Emperor Haile Selassie when UCLA awarded him an honorary doctor of laws degree. UCLA Library Special Collections administers the UCLA Library's rare and unique materials in engineering, humanities, life and physical sciences, medicine, performing and visual arts, social sciences and UCLA history. Its collections encompass rare books and pamphlets from the 15th through the 20th centuries; extensive manuscript holdings; drawings, including original architectural drawings; early maps and atlases; oral history recordings and transcripts; photographs, prints and paintings; and administrative records. The UCLA Library, ranked among the top 10 research libraries in the U.S., is a campus-wide network of libraries serving programs of study and research in many fields. Its collections encompass more than 9 million volumes, as well as archives, audiovisual materials, corporate reports, government publications, microforms, technical reports and other scholarly resources. Nearly 80,000 serial titles are received regularly. The UCLA Library also provides access to a vast array of digital resources, including reference works, electronic journals and other full-text titles and images. 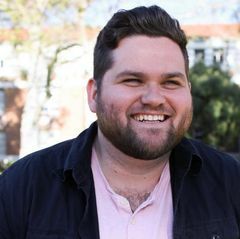 For more news, visit the UCLA Newsroom and UCLA News|Week and follow us on Twitter.